As a professional window cleaner, I see a lot of homes, inside and out…many of them are well-maintained, but many of them are not. When a home goes without regular maintenance and upkeep, it will deteriorate, and will soon start to need more serious work done that will probably become expensive. It’s so much easier to keep up the tasks that will keep your home in good condition and it will be a lot less costly…that’s why I thought I would share with you a few tips of things to do in the Spring to keep your home maintained. The nice thing about working on your home in the Spring is that during a lot of the work you can be outside and enjoying the warmer weather (2 birds with one stone). For your convenience, I have marked the tasks that could be better completed by a professional with this little guy. You’ll be able to breathe easier and your furnace and air conditioner will be able to run more efficiently if you clean your air ducts and vents. While you are thinking about your furnace and air conditioner, this would be a great time to either replace or clean the filters, as with #1 above, your equipment will run more efficiently and probably cut a few dollars off your monthly bill. Spring is a great time of year to remember to replace the batteries on your smoke detectors, and test each one to make sure they are working properly. Check the attic, basement and crawl space, looking for standing water, water stains, leaks or mold. Do a roof and chimney inspection to make sure there is no damage from winter weather, and that everything is in tact and sealed up to protect your home. 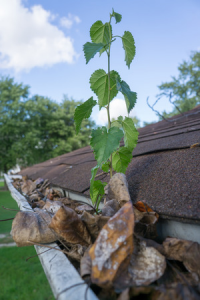 Inspect your gutters and downspouts to make sure they are well attached and water is flowing freely away from your home. If they didn’t get cleaned in the fall, or if they have filled with debris, make sure they are cleaned now. Check your porch, deck or patio to ensure there is no deterioration, nails popping up or weather damage. If you have a sprinkler or irrigation system, you’ll want them checked before you’re ready to turn them on for the summer. Make sure all the heads are in good working order, and adjust them to water only the places you want to grow…not the house, the sidewalk or the street. Check the water faucets by turning them on to be sure none of your pipes were frozen or damaged during winter freezes. Wash your windows, check the seals, the screens and the window sills for signs of damage. 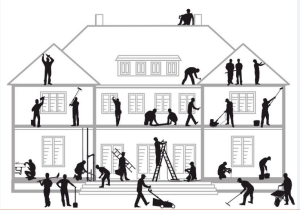 Your home is probably the biggest investment you’ll ever make…it’s job is to protect your family, your job is to keep it maintained (it can’t do it itself). 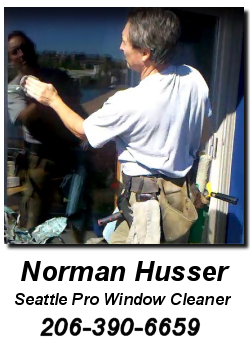 I have been cleaning windows in the Seattle area for nearly 30 years, and quite frankly, I enjoy it! I can also help you with your gutters and other outside tasks. I will be happy to answer all of your questions, and I know the mistakes to avoid. I clean private homes or apartment complexes.